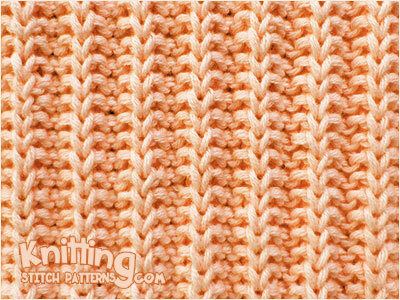 Video tutorial on how to knit the Cartridge Belt Rib stitch. Knitted in a multiple of 4, + 3 sts. Row 1 - RS: Knit 3, * slip 1 wyif, knit 3; rep from * to end. Row 2: Knit 1, * slip 1 wyif, knit 3; rep from * to last 2 sts, slip 1 wyif, knit 1. Bind off in a knit 3, purl 1 rib. How to bind off: Knit 2, slip the first stitch over, knit 1, slip the first stitch over, * purl 1, slip the first stitch over, (knit 1, slip the first stitch over]) 3 times, rep from * to end of row.